The Residence Inn Melbourne, just off I-95, is convenient to Cocoa Beach, Kennedy Space Center, Melbourne Airport (MLB) and Melbourne Beach. 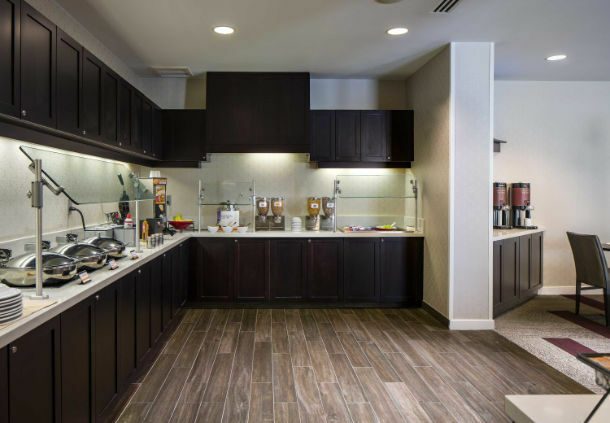 Begin each day at our Melbourne, FL hotel with complimentary, hot breakfast and stay connected with free Wi-Fi offered throughout. Work and relax in pet-friendly, all-suite accommodations, featuring ergonomic work space, fully-equipped kitchens and signature Marriott bedding. Maintain your workout routine at our on-site fitness center, with free weights and cardiovascular equipment, and soak up the sun at our outdoor pool. Visit the Residence Inn Mix™, a unique offering among hotels in Melbourne, for bold local flavors and refreshing beverages on Monday, Tuesday and Wednesday evenings. Traveling for business? Enjoy complimentary business services and host meeting in our 345 sq. ft. boardroom. Whatever your reason for visiting, the Residence Inn Melbourne is ideal for business and leisure travelers alike.